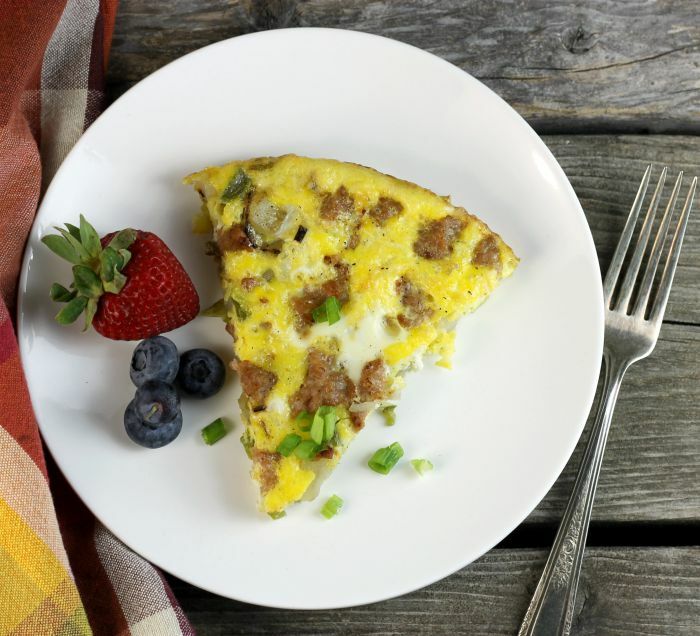 Sausage egg frittata, this is a super easy frittata to enjoy at breakfast, lunch, or dinner, you’re going to love it. 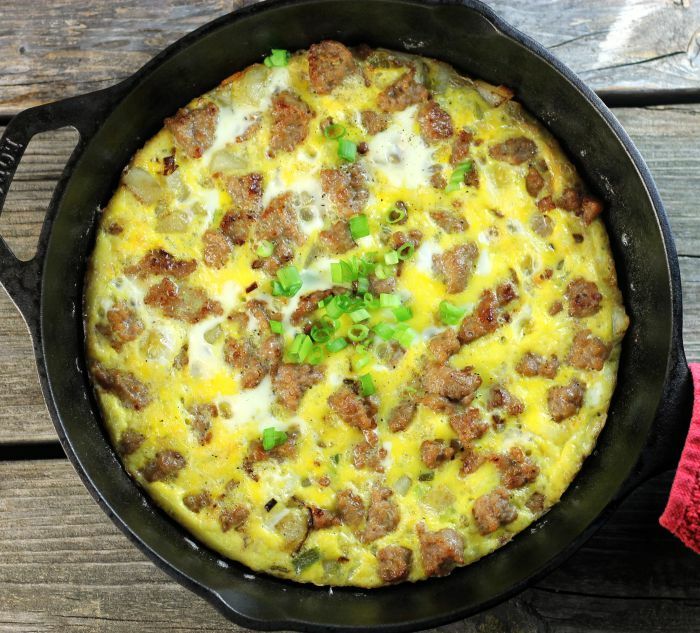 Sausage egg frittata, come together quickly and is made with only five ingredients. I made it a couple of times in one week, it is so delicious. We had it once for breakfast and once for dinner. Have I mentioned that I recently purchased a cast iron skillet? It has been an exciting addition to the kitchen and has opened a whole new way of cooking for me. I have not had an oven friendly skillet before and I am finding out what I have been missing. There are a few recipes that I am working on that are made in my cast iron skillet so stay tuned. My younger sister Lauri was a cook at the local college for a few years. She loved the job. She got to know the students and she loved the cooking that she did there. She was dubbed the Omelet Queen. Yeah, she was known for terrific omelets. I will never be known for my omelets. All that flipping. My omelets have a tendency to fall apart when I go to flip them. That is why I am so excited about this sausage egg frittata. Start with preparing the vegetables. You will want to cut them into small pieces to cut down on the cooking time. Once the vegetables are prepared, add butter to a skillet and melt, then add the vegetables. Cook until the vegetables are fork soft and remove from the skillet. Add the sausage to the skillet and brown. At this point, I butter the cast iron skillet and place the vegetables and sausage evenly in the skillet. (Note: I did not cook my vegetables and sausage in the cast iron skillet, I used a nonstick skillet). Beat six eggs and pour over the vegetables and sausage. Pop it into a preheated oven and bake for 12 to 15 minutes. No flipping and it comes out perfect. 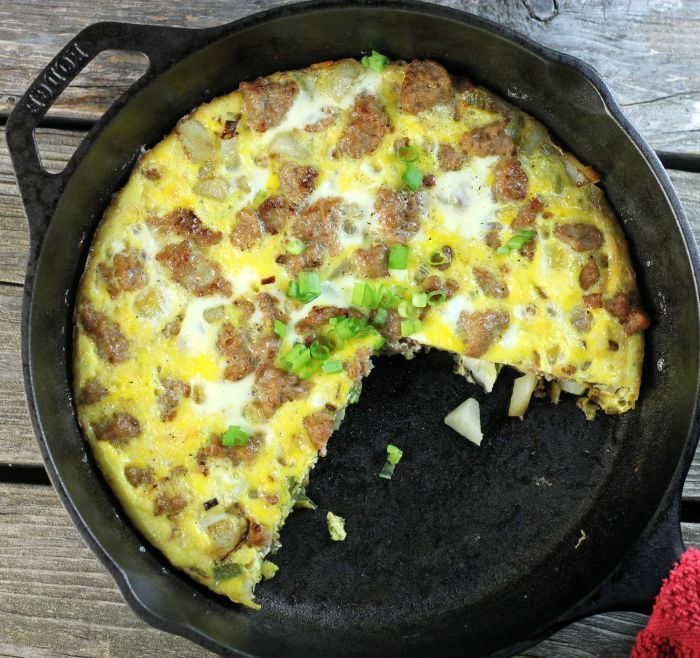 Sausage egg frittata, this is a super easy frittata to enjoy at breakfast, lunch, or dinner, you're going to love it. Prepare the vegetables. Peel the potato and cut into small cubes, cut the green peppers into small pieces, and slice the green onions. Over medium heat melt the butter in a skillet. Add the vegetables and cook for 10 to 12 minutes or until fork tender. Remove from the skillet and add the breakfast sausage. Cook the sausage until brown. Butter a 10-inch cast iron skillet with the remaining butter. Place the vegetables and sausage evenly in the skillet. Take six eggs and beat with a fork. Pour the egg evenly over the sausage and vegetable mixture. Place the skillet in a preheated oven and bake for 12 to 15 minutes or until eggs are set. I love using my cast iron skillets for cooking! They are absolutely one of my favorite pans in the kitchen. We don’t make frittatas all that often, but I’m thinking I need to change that soon…this sounds delicious!! Aren’t cast iron skillets fun? I’m excited to see what else you’re creating with yours! 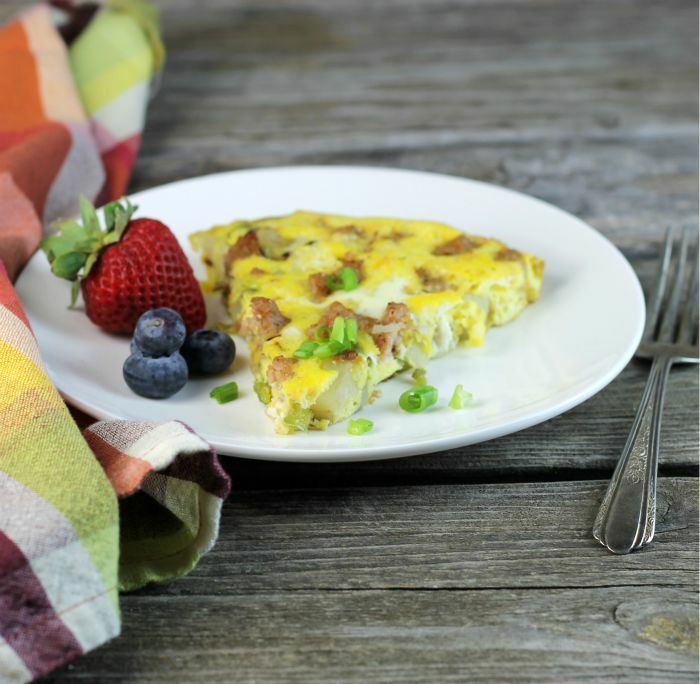 This frittata sounds wonderful! Never met a frittata I didn’t like! Such a fun way to use eggs. Love what you’ve done with this recipe — SO tasty looking. Thanks!